At the end of the short, sun-yellow corridor at the entrance to Spalding House’s HoMA SELECT hangs the museum’s iconic Paul Gauguin painting, Two Nudes on a Tahitian Beach. For those used to seeing the work in the Impressionism gallery in the museum’s Beretania street location, the new setting singles it out in a way that allows visitors to take in every detail. That is just the start of Spalding House director Aaron Padilla’s physical interpretation of the museum’s new Collection Highlights catalog. Viewers can now see 22 of the museum’s best works in a whole new light. The first hallway empties out into a big, open gray-walled space where Lionel Walden’s painting, Hawaiian Fisherman, hangs. The popular work is a prime example of the artist’s masterful skill in depicting the glow of light on the ocean. When viewed from the entryway to the next gallery, the yellow walls behind the work seem to be the source of the painting’s illumination. From one gallery to the next, small connections hold the exhibition together. Aside from the masterfully orchestrated layout of the exhibition, Padilla has also made some surprising art pairings to encourage viewers to take more than just a glance. All of the pieces and their position in the exhibition mean something, and upon deeper inspection, the relationships between the works are revealed. While the pieces on view come from different eras and geographic regions around the world, it is the small details behind each one that bring the larger message together. “Juxtaposing different works from different eras and locations from around the world was important,” says Padilla. “If you take a look at the catalog, the curators put together the pairings, there’s a lot of pieces that would never exist in the same gallery, there’s a lot of pieces that would never be together, but they put them together for formal qualities and relationships.” Showing these works next to each other also create room for new discussions and conversations among viewers. Some pieces are installed in the middle of the gallery floor, inviting viewers to walk right up to them and see it from every angle. Each room challenges the expectations of what museum goers might normally see, while maintaining a theme that connects everything in the room. Colorful and open rooms showcase as many as six pieces, while others show as little as one. The walls, frames of the pieces, the positioning and layout; they all aim to convey a message about a particular moment in time. In another gallery, one of the museum’s monumental imperial Korean screens covers an entire wall, enveloping you from the moment you step into the room. The enormity makes viewers feel small against a backdrop of blue-golden skies and giant cranes. It’s a snapshot of history, peacefully held within a teal room. 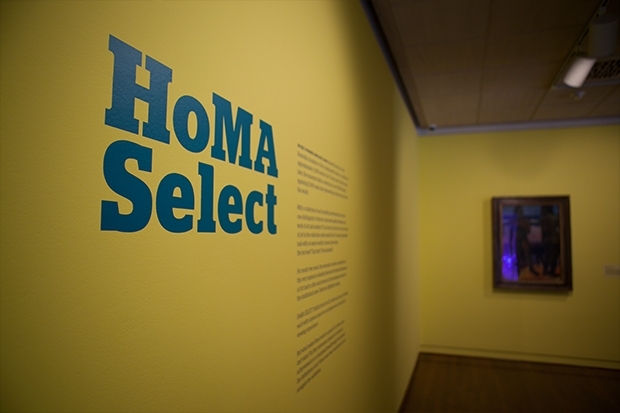 The art and presentation of HoMA SELECT, speaks to a new kind of history, one that brings different parts of the world together.